ABUJA—Pressure mounted, weekend, on the presidency not to compel Chairman of the Independent National Electoral Commission, INEC, Prof. Attahiru Jega to proceed on pre-retirement leave as reportedly being canvassed by some concerned stakeholders in the polity. The anti-Jega forces had been pushing the presidency to remove the chairman from office, a move that was last night described as dangerous by notable lawyers. The pressure came in the face of heightened tension in the commission over the alleged moves. The chairman’s five-year term comes to an end on June 30 and though he is qualified for re-appointment, the chances of such have become remote given recent allegations of bias against the chairman by campaign officials of President Goodluck Jonathan. The mood at the headquarters of INEC, weekend, was that of resignation to fate, as most of the officials, adopted a ‘wait-and-see’ disposition over Jega’s fate following claims of surreptitious moves to force the chairman out of office ahead of the first of the national elections on March 28. A top official of the commission told Vanguard, yesterday that they were still working with the hope that the elections would hold as rescheduled and that the chairman would be allowed to conduct it before going in June. The tension followed claims by the All Progressives Congress, APC, Senate caucus of the discovery of a plot by the presidency to send Jega on pre-retirement leave as a way of clearing the way for the Peoples Democratic Party, PDP, to emerge victorious in the forthcoming national elections. PDP officials had in recent times kicked against the insistence of the commission to use the card reader and the Permanent Voter Cards, PVCs. Among those who spoke against the alleged move to send Jega on pre-retirement leave were Prof. Itse Sagay, SAN, Mr Femi Falana, SAN, Chief Olisa Agbokoba, SAN, Chief Mike Ozekhome, SAN and Prince Orji Nwafor-Orizu. Chief Fredrick Fasheun, who is also a supporter of the second term aspiration of the president, also opposed any premature exit of Jega. Constitutional lawyer, Professor Itse Sagay said that any attempt to remove Jega from office through what he called “political retirement” would set the country on fire. In a telephone interview with Vanguard, Sagay said the INEC chairman cannot be removed from office at this time under the pretence of retirement on two grounds. Falana, on his part, said: “Prof. Jega is on leave of absence from the Bayero University. He won’t be due to retire until the age of 70. That is when he would go on terminal leave. He is on a five-year renewable tenure. His first term ends on June 30, 2015 and the appointment enjoys constitutional flavour. “The chairman is not a career civil servant. However, only the President can sack him with the consent of the Senate. A similar thing was done in the case of Lamido Sanusi, who was suspended. I do not believe that he should proceed on terminal leave like a core civil servant. If he were to be dismissed, the National Assembly needs to be consented the same way his appointment was done. In his reaction, a former President of the Nigerian Bar Association, NBA, Chief Olisa Agbakoba (SAN) said removing the chairman of INEC will not be good for nation’s polity. Asserting that Jega cannot be disciplined except under extant laws, Nwafor- Orizu an, Abuja based constitutional lawyer said: “No, the INEC chairman is not a civil servant, and the Constitution by Section 158 is specific that INEC should not be subject to the direction of any other authority or person. Nwafor-Orizu further contended that compelling Jega to go on leave and he refusing could cause a constitutional jam as the INEC chairman under the constitution does not have a supervisor to discipline him. On his part, founder of the Oodua Peoples Congress, OPC, Dr Fredrick Fasheun said the INEC chairman should be allowed to conduct the general elections. 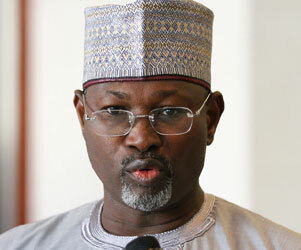 The gloom in the commission heightened at the weekend following suspicions that the Presidency had concluded moves to remove the Chairman of the electoral body, Prof Attahiru Jega, and replace him with a ‘more friendly and amenable’ hand to do its bidding to prevent the opposition from coasting home with victory. Although President Jonathan had initially denied the claim that he was shopping for Jega’s successor, hordes of his foot soldiers have insisted that the professor of political science must be replaced for insisting on using card readers and permanent voter cards for the polls, a development, they claim, would likely disenfranchise their supporters. To prove their opposition to Jega’s stance on the use of PVCs and card readers for the polls, many pro-Jonathan groups and friends have filed suits asking the courts to disallow the use of the facilities. The groups had waited patiently for the postponement of the elections last month, to challenge Jega and INEC. While Nigerians had taken Jonathan by his words that he was not planning to force Jega to proceed on pre-retirement leave, opposition Senators raised the alarm last week, alleging that they had credible information that the Presidency had concluded plans to remove the INEC boss to pave the way for the enthronement of a crony to its bidding. According to the Senators, the pre-terminal leave letter would come from either the office of the Head of Service of the Federation, OHSoF or that of the Secretary to the Government of the Federation, OSGF. But findings by Vanguard revealed that the OHSoF was not in possession of the said letter as at the close of work last Friday. When Vanguard inquired about the said letter, senior officers in the OHSoF denied knowledge of the said document, claiming that it was news to them, as the INEC boss was not reporting to that office. One of the sources in the OHSoF described the link between Jega’s alleged pre-terminal leave letter to the OHSoF as shocking since according to them, “the distinguished senators are supposed to know that the office does not deal with political appointees like Jega but with core civil servants”. Meanwhile, the mood at the Headquarters of the INEC, was that of resignation to fate, as most of the officials, adopted a ‘wait-and-see’ disposition over Jega’s fate following the APC Senators’ allegation and mounting attacks on him by supporters of the President.